Lotto betting is making a bet on the result of the official lottery draw — specifically, which lottery balls (numbers) will be drawn. You pick the numbers that you think will be drawn and if you guess correctly, you will win prizes — usually in the form of cash. The size of the prize will depend on the number of balls (numbers) you guess correctly. In terms of choosing numbers, lotto betting may be the same, but you are not buying a lottery ticket in the official draw. 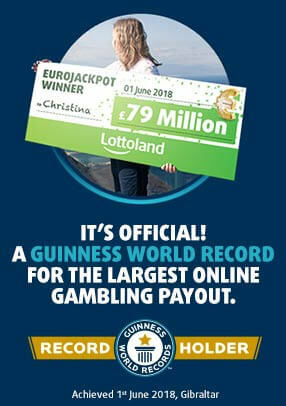 Lotto betting is conducted through a seperate independant company, such as Lottoland, which is not connected in any way to the relevant lottery operator. Any money you win is paid out by Lottoland, not the official lottery operator. So, for example, let’s say you bet on the US PowerBall jackpot and correctly guess all of the numbers that are drawn. Lottoland will pay you the prize money, not the official PowerBall operator in the US. Lottoland will match the prizes of each tier, including the jackpot, that the official lottery operators pay out, as if you had won with an official lottery ticket. So, for example, let’s say you bet on a lottery, such as the US PowerBall, and you guess 5 numbers (but not the PowerBall). This would win you the second prize tier which is about £34,000. Lottoland will match this prize and pay you the prize money. How can Lottoland pay such high jackpot amounts? Lottoland operates an insurance model which means that each bet someone makes is insured. Lottoland will pay all smaller wins directly from the revenue they receive from sales. Larger jackpot wins will be covered by Lottoland’s insurance model. This insurance-based business model enables Lottoland to offer their players the ability to win huge jackpots, offered by official lottery operators, from all over the world. Why not just buy a lottery ticket? Our offer is very different; for starters, we don’t sell physical tickets. Everything is done online, plus we are not connected to the relevant lottery operator. Our betting model also gives us the freedom to offer our players free bets, special offers and unique features such as Double Jackpot. We can also offer ‘special jackpots’ higher than those available elsewhere. If you have any questions please feel free to reach out to our customer services team, they will be more than happy to help you. biggest and best the world has to offer? * If you win you will receive the same payouts for each prize tier as you would have, had you purchased a ticket from the base lottery operator. For more information please read the Payout Rules for each game prior to playing, to understand how much you would win if there were other winning players, or winners of the base lottery draw. Terms and conditions apply.